Back in March I wrote a blog post about the idea of a Terminology Marketplace. 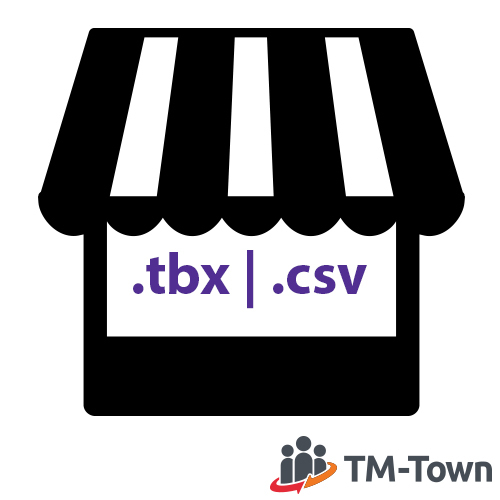 Today I am excited to announce that the TM-Town Terminology Marketplace is now live and features glossaries available for purchase across more than 552 unique language pairs. These first terminology files were provided by Henk Sanderson and are bilingual files extracted from the European Union’s IATE Termbase and formatted for various CAT tools. Henk has spent a considerable amount of effort to clean up issues and problem areas found in the raw IATE download to save you the time and hassle of having to deal with the large download and extraction process yourself. 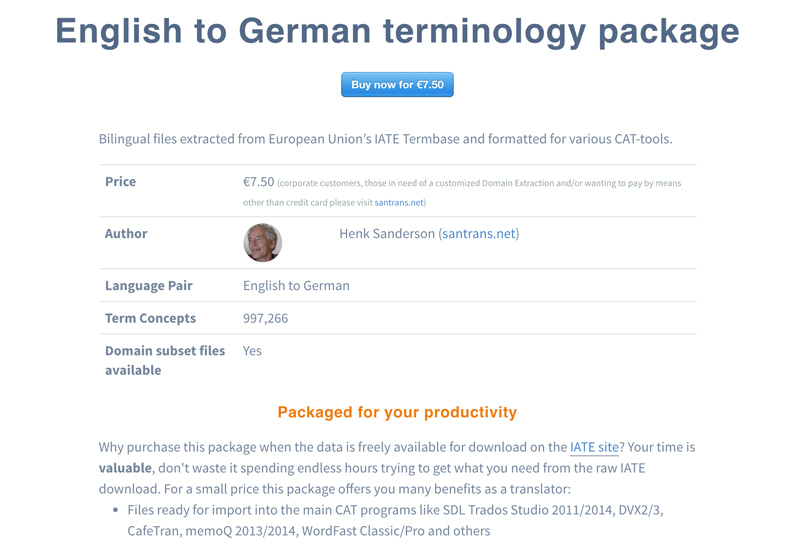 Henk has set prices in the range of €5.00 to €7.50 for the terminology files he prepared. Purchases can be made by credit card. Once purchased the files remain backed up in your TM-Town account and you can re-download them at any time. 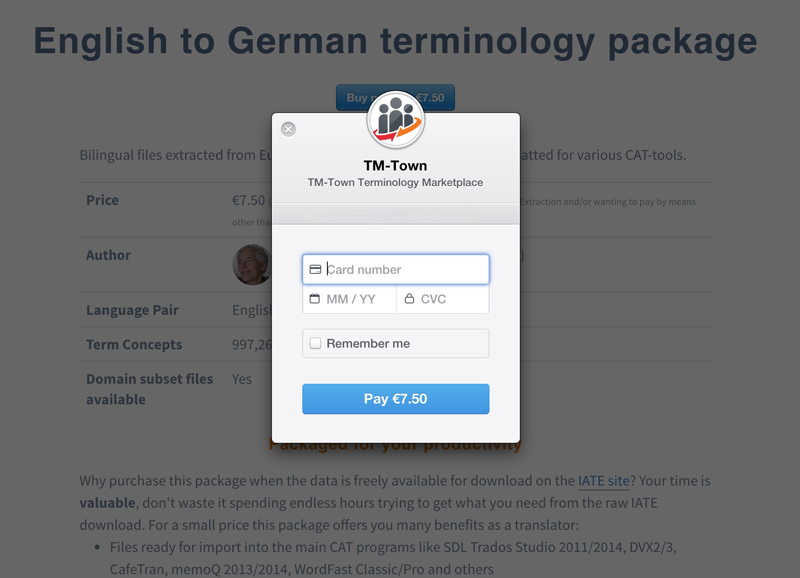 The TM-Town Terminology Marketplace is open to all translators. If you are a professional translator with a terminology file that you think would benefit your fellow translators and you would like to try selling it on TM-Town, please send us an email. If you have any ideas, thoughts or suggestions about this new marketplace, please leave a comment below. I look forward to hearing from you! Finally, don't forget to shop the new TM-Town Terminology Marketplace for high quality terminology glossaries in your language pair. Canada Posted over 3 years ago. I purchased the English to French version of Henk's IATE terminology package and had no problems creating and filling the TB and TM files in my Trados Studio 2014, following the clear instructions that came with the package. Thank you so much! There were 0 errors in creating the TM (single file). For the TB, I split the data into three files to avoid going beyond 2 GB (which according to the instructions might corrupt the last file): 1) abbreviations + main units 01 and 02 = 1.65 GB; 2) main units 03, 04 and 05 = 1.50 GB; 3) main units 06, 07 + 1-, 2- and 3-character sections = 950 MB. I believe one of the files (sorry, I don't remember which one, but possibly main unit 03), reported something quite different from 100 000 entries, but without signaling an error. My native language is French Canadian, so these tools will be a godsend the next time a client specifies that the target language is French for France.